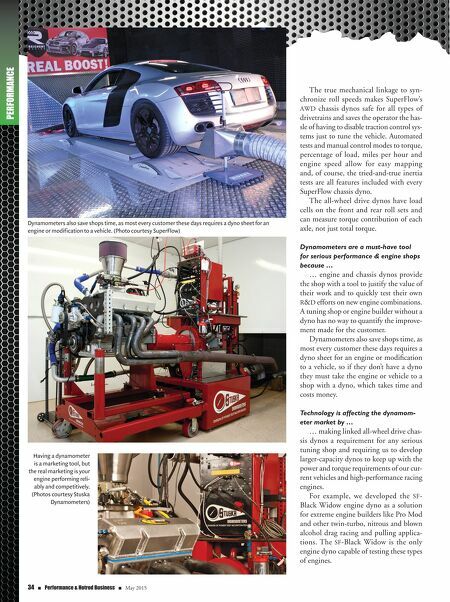 May 2015 n Performance & Hotrod Business n 35 Owning and operating a dynamometer is easier than one might think because … … we're here to help from the initial sale to ongoing support. 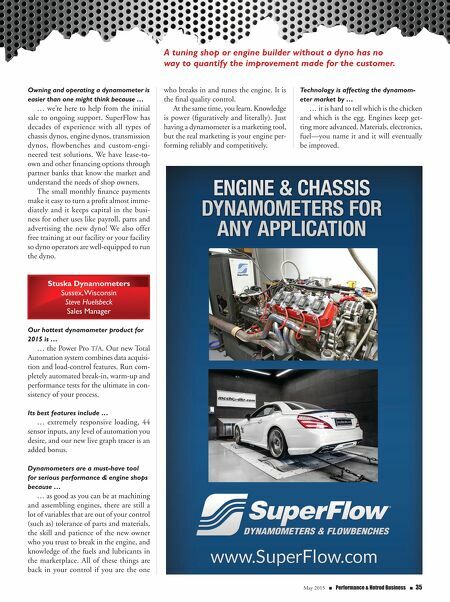 SuperFlow has decades of experience with all types of chassis dynos, engine dynos, transmission dynos, flowbenches and custom-engi- neered test solutions. We have lease-to- own and other financing options through partner banks that know the market and understand the needs of shop owners. The small monthly finance payments make it easy to turn a profit almost imme- diately and it keeps capital in the busi- ness for other uses like payroll, parts and advertising the new dyno! We also offer free training at our facility or your facility so dyno operators are well-equipped to run the dyno. Stuska Dynamometers Sussex, Wisconsin Steve Huelsbeck Sales Manager Our hottest dynamometer product for 2015 is … … the Power Pro T/A. Our new Total Automation system combines data acquisi- tion and load-control features. Run com- pletely automated break-in, warm-up and performance tests for the ultimate in con- sistency of your process. Its best features include … … extremely responsive loading, 44 sensor inputs, any level of automation you desire, and our new live graph tracer is an added bonus. Dynamometers are a must-have tool for serious performance & engine shops because … … as good as you can be at machining and assembling engines, there are still a lot of variables that are out of your control (such as) tolerance of parts and materials, the skill and patience of the new owner who you trust to break in the engine, and knowledge of the fuels and lubricants in the marketplace. All of these things are back in your control if you are the one A tuning shop or engine builder without a dyno has no way to quantify the improvement made for the customer. who breaks in and tunes the engine. It is the final quality control. At the same time, you learn. Knowledge is power (figuratively and literally). Just having a dynamometer is a marketing tool, but the real marketing is your engine per- forming reliably and competitively. Technology is affecting the dynamom- eter market by … … it is hard to tell which is the chicken and which is the egg. Engines keep get- ting more advanced. Materials, electronics, fuel—you name it and it will eventually be improved.